In small bowl, mix crushed granola bars and pecans; set aside. In large bowl, beat cream cheese with electric mixer on medium speed until smooth. Beat in whipped topping, marshmallow creme, shaved white chocolate and yogurt until well blended. 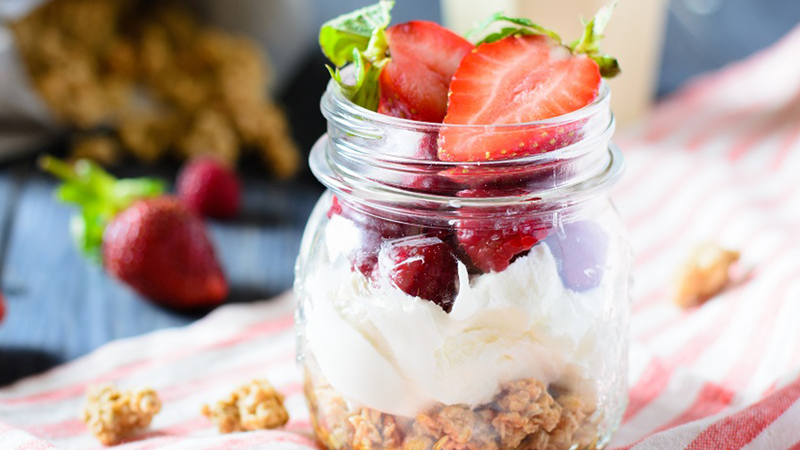 In each of 2 (14-oz) parfait glasses, layer 1/4 cup granola mixture, about 1/2 cup yogurt mixture and 1/4 cup sliced strawberries. Repeat layers. Top each parfait with 1 tablespoon remaining granola mixture. Garnish each with additional strawberry slices, white chocolate curls and mint leaves. Serve immediately.